"I reuse black nursery trays and pots for plant divisions and seedlings that I pass on to neighbors or trade at an annual plant swap. If I get too many containers to use myself, I take them to Lowes for recycling. You can give the black plastic containers to any employee in their garden center and they give it to a vendor to sterilize and reuse or recycle at the end of the pot’s useful life. I’m so glad this program exists because the black plastic is not accepted in my city’s curbside recycling." 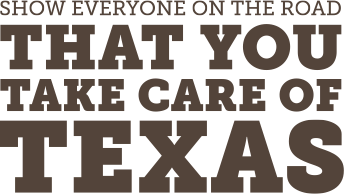 Thanks to Abbey for sharing how she and her family take care of the Lone Star State! We want to hear from you, too—tell us about the fun, creative ways that you do your part.